National Service Day was officially declared to be held on September 19th, a day to commemorate the passing of the Late George Price who died in 2011. The Right Hon. 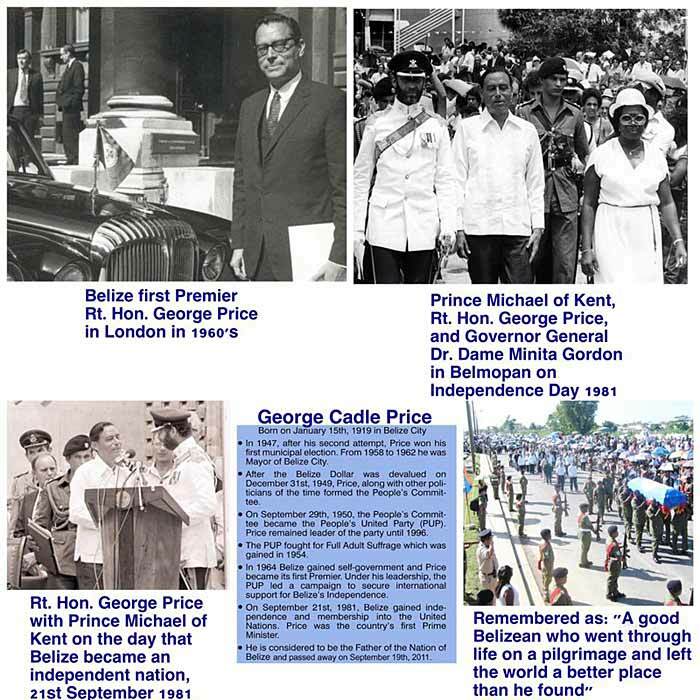 George Price led Belize to independence on the 21st of September 1981 after starting the peaceful, constructive Belize Revolution in 1950. In Memory of Rt. a Hon George C. Price. 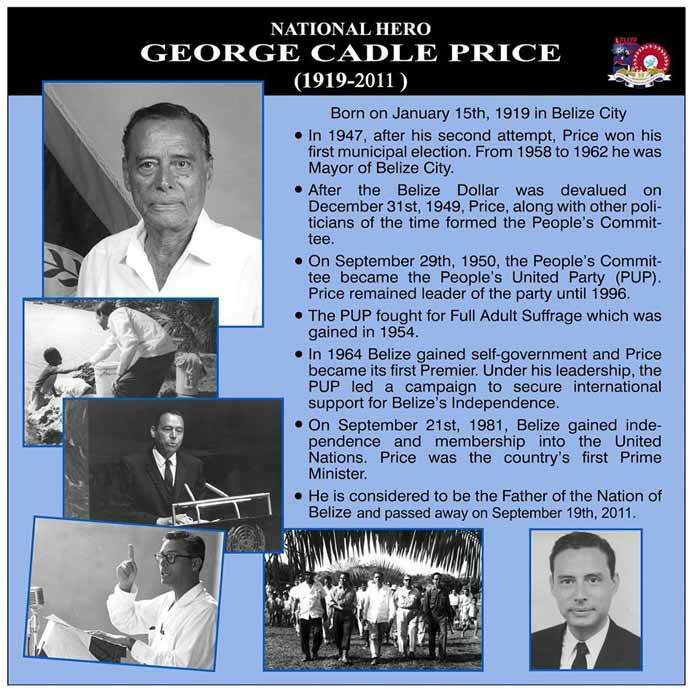 George Cadle Price, PC, OCC (15 January 1919 – 19 September 2011), was a Belizean statesman who served twice as the head of government of Belize from 1961–84 and 1989–93. He served as First Minister and Premier under British rule until independence in 1981 and was the nation's first prime minister after independence that year. He is considered to have been one of the principal architects of Belizean independence. Today he is referred to by many as the "Father of the Nation." 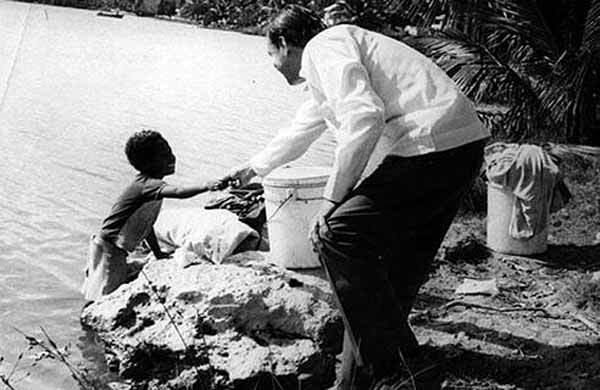 Price effectively dominated Belizean politics from the early 1960s until his 1996 retirement from party leadership, serving as the nation's head of government under various titles for most of that period. Born in Belize City in what was then British Honduras, to William and Irene (née Escalante) Price, he entered politics in 1947 with his election to the Belize City Council. In 1949, with the devaluation of the British Honduran dollar he, together with a group of citizens formed the People's Committee. It was the start of the "peaceful, constructive Belizean revolution". On 29 September 1950, he co-founded the People's United Party, which he led for four decades and which was devoted to the political and economic independence of the British colony, then known as British Honduras. Upon graduation, young George felt a call to the priesthood, so he went to study abroad, first attending the Saint Augustine's Minor Seminary in Mississippi, USA, and later the Mayor Seminario Conciliar in Guatemala City. Throughout his life Price remained a devout Roman Catholic and attended Mass daily. The war in Europe prevented him from completing his studies in Rome and, instead, George Price returned to Belize. He was hired by local businessman Robert Sidney Turton as his private secretary. He also rallied a few SJC graduates, some of them later members of the PUP, to contest elections in 1944 and 1947 for the local Town Board, being successful in 1947. Price also contributed to the Belize Billboard, then run by Philip Goldson. Price, upon the formation of the People's Committee (PC) in 1950, was named its Assistant Secretary, and in a famous speech later that year claimed that "National Unity" propelled the PC's actions. With the formation of the PUP, Price's stature rose and he ascended through the party ranks until he became Party Leader following a leadership dispute in 1956. In September 2000, Price became the first person to receive Belize's highest honor, the Order of National Hero, for the prominent role he played in leading his country to independence. He has received similar honors in the other Caribbean and Central American countries. In 1982, he was made a member of the Privy Council of the United Kingdom. WHENEVER GEORGE PRICE WAS ASKED, HOW BELIZE ACHIEVED ITS INDEPENDENCE ? HIS ANSWER WAS SIMPLE, " Thanks to the Belizean people." When analized , his answer was PERFECT. The Independence of Belize was not won over TABLE TALKS. The Independence of Belize did no fall from heaven. The Independence of Belize was not GRANTED by the United Nations, as some people are led to believe. . The Independence of Belize was not served in a GOLDEN PLATTER. THE INDEPENDENCE OF BELIZE WAS WON, with Sweat Blood and Tears. OUR Teachers, - Public Officers, - our Doctors and Nurses, - our Policemen. - our Soldiers, - our Engineers, - our Street and Drain cleaners and others who gave their service to make Belize what it is today.
" WHY DON'T YOU GO FOR INDEPENDENCE. " Mr. Price replied.- " Not YET, I have to go to consult, and prepare OUR PEOPLE. " - - - - " consult and prepare our people. "